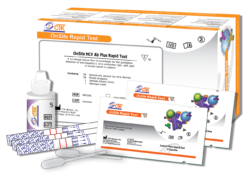 Hepatitis C virus (HCV) affects 150-200 million people worldwide and is now endemic in many regions, particularly Asia, North Africa and the Middle East, with significant rates of infection in Southeast Asia and Latin America. Many individuals remain undiagnosed until years or decades after initial exposure leading to unrecoverable chronic liver damage and the spread of HCV infection. 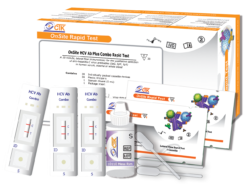 Early and effective detection of HCV infection is critical for initiating early treatment to yield a more successful prognosis and screening of blood bank supplies to prevent transmission by blood transfusion, the leading risk factor. The first step in diagnosing HCV is a screening test for anti-HCV antibodies.